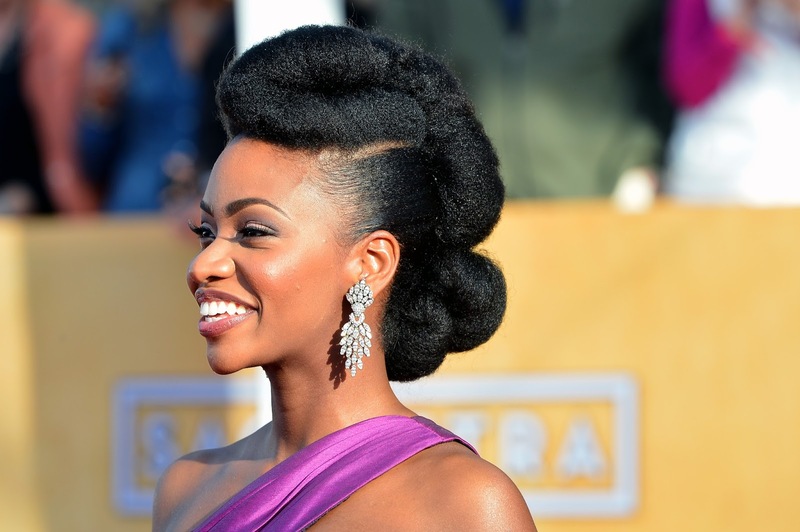 Teyonah Parris, best known for her role as Dawn Chambers, the first major African-American character on AMC's Mad Men, and her breakthrough role in Dear White People took to Twitter to share a story of feeling objectified by an older white man who felt within his rights to not only ask about the authenticity of her hair, but also place his hands in it. The fascination with natural black hair is nothing new and the actress's tale is unfortunately all too familiar to many. It serves as an important reminder that black women and their hair are constantly objectified, whether it be through ridicule or fetishization, and it is never okay. As Yesha Callahan put it at The Root, "We natural haired women are not chia pets at your disposal. We are not a social experiment looking for your approval and furthermore, if chopping fingers of those guilty of grabbing hair was legal, there’d be a sea of fingers across the country." Having tea at The Ritz w/beautiful brown folk. Old Man walks over boldly asks me "Is that yours or an add on?! "Clearly referring tomy hair. wear that hair bc it's stimulating." I say "Excuse me?" He says "I'm saying I like it." I reply "That's all you had to say. You like it." Im pretty sure he left as clueless as he arrived. Yup, it's 2015. There's levels to this type of #ignorance and #privilege.